Taurine is a compound (a type of amino acid) occurring in a human body (brain, heart, eye, muscles, bile and small intestine) which may be beneficial in hypothyroidism. Low taurine levels have been seen in hypothyroidism, anxiety and depression. Taurine levels have been linked with thyroid function. Vegetarians are also at a higher risk of taurine deficiency. Taurine has many roles in the body. It is important for thyroid hormonal function. It is not exactly clear how it does that. My understanding is that potassium mineral is needed for activating energy production by thyroid hormones in energy houses of cells and taurine keeps potassium inside of cells and therefore helps the thyroid hormones start that energy production. Also taurine is important for glutathione production and is a powerful antioxidant which controls free radial damage inside the cells. It is also involved in liver detoxification processes and helps to remove toxic metals such as mercury and cadmium which interfere with thyroid function. It may also help to displace toxic halogens in the body and replace them with iodine and that way improve the thyroid function. Taurine is also important for gallbladder function, stabilizing cell membranes and heart health. It helps with obesity and the function of the immune system. 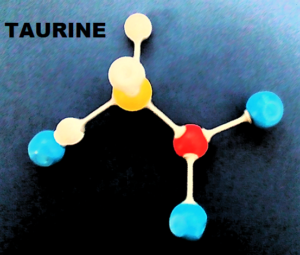 Taurine may help to utilize copper. It increases insulin sensitivity. It also may reduce anxiety. Taurine acts like mild diuretic, removing excessive fluid from the body as it balances potassium, magnesium and sodium. Taurine may therefore be useful for women suffering from oestrogen dominance and fluid retention. It may also reduce blood pressure. A common problem seen in people with thyroid autoimmunity and hypothyroidism is low iron storage level and helps to improve absorption of iron. Our bodies can produce some taurine or obtain it from food. Taurine is found in meat, fish, eggs, dairy, cottage cheese, cheese, brewer’s yeast, colostrum and some energy drinks but not in vegetables. Taurine is made from cysteine amino acid in the body. Turkey meat, eggs and cottage cheese are high in cysteine. Sunflowers seeds and oats also contain cysteine. A combination product, such as magnesium taurate may help with common deficiencies of taurine and magnesium, both commonly found in hypothyroidism. Most of us with autoimmunity and hypothyroidism needed to take iron supplements at some point and it takes a long time to obtain optimal levels. A study (1) of 52 women with iron deficiency anaemia has shown that women who took taurine 1g/day, 6-8 hr after iron sulphate supplements, had significantly better serum ferritin levels and mean serum haemoglobin concentrations compare to controls who did not take taurine with their iron supplements. The mechanisms of actions of taurine to enhance iron levels are not clearly understood. Iron deficient women were shown to have lower levels of taurine before the study when compared to normal subjects. Taurine is an antioxidant and stabilizes cell membranes and therefore might help iron absorption into the cells that way. It might also increase survival of red blood cells. Women supplementing with taurine showed no side effects of supplementation. My personal theory is that iron competes with copper for absorption in the small intestine. As taurine may help to utilize copper, the need for copper absorption is decreased and iron absorption increases. Both iron and copper are vital for thyroid hormones to work properly. Another study (2) has found that vitamin B12 levels were lowered with iron deficiency anemia in females. Therefore it is important to have normal iron levels. Taurine may play a protective role against the increased oxidative stress resulting from hypothyroidism as shown in study in rats (3). Taurine also increases platelet glutathione levels (6). The levels of taurine in platelets are lower in hypothyroidism which seems to be connected to increased aggregation of platelets, higher viscosity of blood and inflammation which may possibly increase the risk of thromboembolism (obstruction of a blood vessel by a blood clot) (9). Please consult your doctor before taking taurine as supplement. Taurine supplements may have negative effects in people with blood clotting or bleeding disorders as it thins the blood. You can get your levels tested and whole blood taurine is regarded as most accurate test (8). Taurine deficiency may be associated with vitamin B6 deficiency (7). Doses of 1g/day of taurine generally are not a problem. After all, that is the average dose of taurine in an energy drink can. However, like with everything else, the taurine effects depend on what else is going in the body and may be individual. Taurine was mentioned in some forums as having negative effects on symptoms of Graves’ disease in some individuals as it increases energy. It is recommended in the literature to have natural sources of taurine, not supplements in case of Graves’ disease. Sirdah MM, El-Agouza IM, Abu Shahla AN. Possible ameliorative effect of taurine in the treatment of iron-deficiency anaemia in female university students of Gaza, Palestine. Eur J Haematol. 2002 Oct; 69(4):236-42. Mahmoud Mohammed Sirdah, Maged M. Yassin,b Sabreen El Shekhi,b and Abdel Monem Lubbadb. Homocysteine and vitamin B12 status and iron deficiency anemia in female university students from Gaza Strip, Palestine. Rev Bras Hematol Hemoter. 2014 May-Jun; 36(3): 208–212. Tas S, Dirican M, Sarandöl E, Serdar ZThe effect of taurine supplementation on oxidative stress in experimental hypothyroidism Cell Biochem Funct. 2006 Mar-Apr; 24(2):153-8. Hiroshi Ogawa, Tomoyo Nishikawa and Sukenari Sasagawa. Effects of Taurine on Lipoprotein Metabolism in Hypercholesterolemic SHRSP Associated with Hypothyroidism. Japanese Heart Journal. 1987; 28(4): p 643. Baskin S, Klekotka SJ, Kendrick ZV, Bartuska DG. Correlation of platelet taurine levels with thyroid function. J Endocrinol Invest. 1979 Jul-Sep;2(3):245-9. Hayes KC, Pronczuk A, Addesa AE, Stephan ZF. Taurine modulates platelet aggregation in cats and humans. Am J Clin Nutr. 1989 Jun; 49(6):1211-6. Lombardini JB. Taurine levels in blood and urine of vitamin B6-deficient and estrogen-treated rats. Biochem Med Metab Biol. 1986 Apr; 35(2):125-31. Trautwein EA, Hayes KC. Taurine concentrations in plasma and whole blood in humans: estimation of error from intra- and interindividual variation and sampling technique. Am J Clin Nutr. 1990 Oct; 52(4):758-64. McCarty MF. Sub-optimal taurine status may promote platelet hyperaggregability in vegetarians. Med Hypotheses. 2004; 63(3):426-33.